Getting a little panicky, as I realized that since May is our last month in this house (and good f’ing riddance)…we should probably start considering looking for a new place. There’s just so much up in the air right now…not having a job is making it a little worrying to pick a location to live for the next year. What worries me the most is that we’ll need to find somewhere to live during the month of April, which is also when I stop receiving money, so I need a job that pays at least $12 an hour to be able to cover all of my bills. If all goes well, this might mean that I know where I’m working before the actual location selection process, or if I don’t, it means we have to find somewhere to live (which would most likely be Fort Collins) and that location will also be where I get to look for retail employment…competing with college students who are younger and cheaper. The likelihood of me finding a great job in Fort Collins is sadly pretty low at the moment: for every 30 job postings I see in Boulder or Denver, there’s maybe one or two in Fort Collins. The business culture of Fort Collins just doesn’t seem completely ready for my type of skills yet…heck, even a lot of the companies I’ve applied for in Boulder/Denver are finding that maybe they’re not quite ready yet, either having hired too many people recently (in other departments) or being unsure of who’s going to be in charge of the new hires in these new positions, not getting the projects they were anticipating, etc. I’ve only gotten a couple of actual rejections…the rest of the companies I’ve heard from are either postponing their hiring or decided against hiring someone altogether. 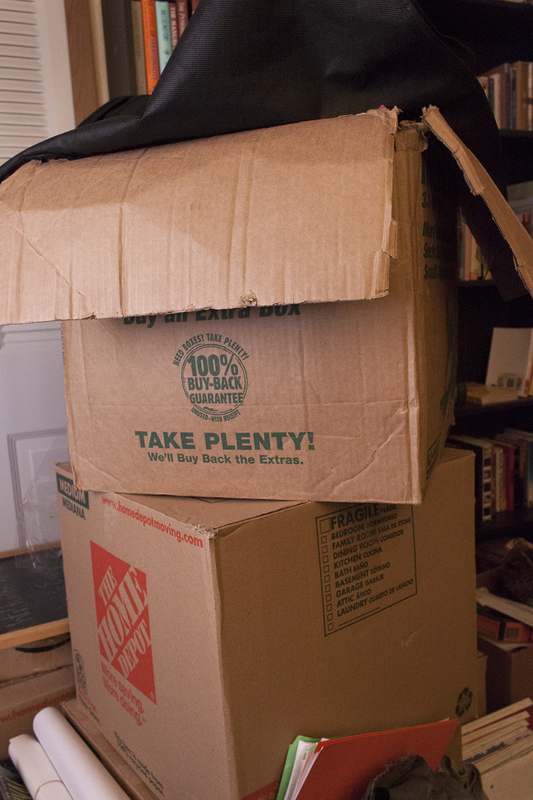 I am realizing that some things are better just left in boxes semi-permanently. I have a good deal of craft stuff that doesn’t need to be out and available at all times, but that I have no intent of throwing away. Also a lot of computer software/equipment that isn’t in regular use (or doesn’t need to be out once it’s installed), but still needs to be kept around. I also have a decent amount of winter clothes that need to be packed away for a certain segment of the year, as well as an ever growing collection of costume-clothes, which have been living in a pile since I filled my last big rubbermaid with costume stuff. Even though I disposed of a decent-sized box full of ancient paperwork and receipts, I still have a good box or two full of more recent paperwork…stuff that needs to be shredded. And shoes. How the heck do other people keep shoes organized? I feel like I don’t have as many as some people, but they’re in a couple of really unwieldy boxes instead of out where I can use them. I went on a pretty heavy shoe purge before the last time I moved and got rid of anything I never wore, were too uncomfortable, or simply didn’t fit…I’m still left with a lot. The same goes for clothes, I got rid of a massive box of stuff that I simply couldn’t wear or hated, but I’m still left with a ton of clothing, and now I’m down to having to be honest about what I probably won’t end up wearing. I just haven’t been able to organize either my clothes or my shoes well enough to really utilize all that I have. I end up getting fairly nihilist about the entire thing. Do I really need to keep any of these magazines I spent money on at some point in time? Do I need this box of jewelry that I don’t wear very often? Do I need more than three pairs of shoes? Does any of this crap matter? Granted, there are certain things I would feel a huge pang of sorrow if I were to be without them…”what do you mean I don’t have any plain black tank tops? !” Other things, like expensive electronics (my computer, xbox, camera, phone, etc.) will be wrested from my grasp only when one of us are dead. I think I need to get myself a good stack of big rubbermaid bins…everything that I know needs to be packed up for long periods of time, that I would also like relatively waterproof (which I have recently learned the value of) needs to be in a stackable, easily found form. I need to (probably) get rid of a big stack of magazines. I have a big box of old lotions and soaps and shampoos and the like that I can sort through and get rid of at least half. I have a bit of makeup that’s old, or that I haven’t opened or used (or have used once and it’s awful) that I could probably throw out. I’m not sure I’m in a good place to deal with any of this stuff…what if I’m too careless and throw out something I regret later? What if I’m too gentle with myself and not getting rid of everything I should?